...or until Treyarch butchers it like they do the actual Call of Duty games. 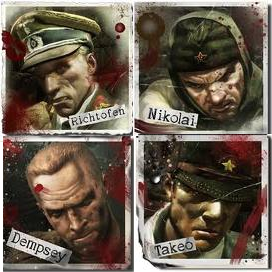 The origin of the zombies is widely known and agreed to be the fault of Dr. Ludwig Maxis, Edward Richtofen, and a faulty teleporter. Zombies were being spawned from the corpses of those who had volunteered to be test subjects of the teleporter. (The volunteers were most likely vagrants and random homeless people because the Nazis detested the homeless, and found great use for gassing them or using them as playthings.) The test subjects were either severely gibbed, as heard from a radio transmission in Der Riese, or sent through the mainframe, leaving them in some God-Forsaken place near the plant, which caused spawning points for the zombies. Not even turning on the electricity can prevent that, even though it does solve most problems if the player isn't already being swarmed by flies zombies. The zombies proved stubborn, and had to be killed. Through the course of several tests (and various killings and maulings), the teleporter seemed stable, but the test subjects disappeared when teleported. Hellhounds then came into the blood-stained picture. Dr. Richtofen, a little more paranoid and unstable than normal (normal is used loosely), goes along with another teleportation experiment and fetches Fluffy, Samantha Maxis's dog. Richtofen placed the dog into the teleporter, the teleporter made a noise, rattled a bit, hissed angrily, rattled a bit more, and the dog disappeared. A few seconds later, the teleporter door shuts, and electricity balls up in the teleporter, and growling can be heard. 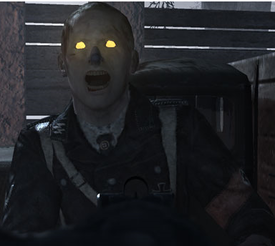 Richtofen, in a burst of insanity, locks Ludwig and Samantha in the same room as the dog. Screams can be heard, and the transmission ends. In a later transmission, Maxis can be heard committing suicide out of depression over the loss of his daughter as zombies raze the Der Riese project. (Though it seems Treyarch likes to contradict itself, Maxis is indeed alive enough to kill himself.) The zombies eventually went dormant, but were awoken by Samantha to completely and utterly destroy Richtofen's delusional fantasy of controlling the zombies himself. Corporal Tank Dempsey is the pumped-up stereotype of a U.S. Marine war hero. He tends to have a very cocky personality when it comes to killing zombies, but is overall very stupid, often taking insults from Dr. Richtofen without taking notice. He also cannot pronounce Wunderwaffe (vʊndɐˌvafə), but he insists on saying "Wonder Waffle", causing a great deal of pain to Dr. Richtofen, and causing everyone else who plays Nazi Zombies to pronounce it that way also. Dempsey also has a darker side, occasionally having morbid hallucinations of false glory, much like Dr. Richtofen. Nikolai’s bloody and morbid reputation spread quickly through Russia, and the government hated him for it. As soon as the war started, Nikolai was dropped at the front line and forgotten about, where he wallowed in self pity, vodka, bullets (and more vodka) for several years on end. He apparently hates Takeo and Richtofen, and often openly exclaims it. However, he seemingly respects Dempsey and they are often able to converse without Nikolai breaking out into a seething rage (a rare case within itself), which doesn't seem like normal behavior for Nikolai because he is always drunk beyond the point of coherence. Takeo Masaki (Japanese: まさき たけお) is an Imperial Japanese Soldier. As a descendant of a long line of samurai, Takeo is destined to turn on the power bring his family honor through bloodshed his service in the Imperial Japanese Army. He has an unhealthy, neurotic obsession with "honor," which is often applied to points and/or ammunition. (As stated by the quote, "No ammo, no honor!") Takeo is also very susceptible to motion sickness, has he vomited after using a teleporter in "Call of the Dead." (That could be, however, blamed on the other members of the posse, as it is likely that none of them had bathed in quite some time.) Takeo openly supports his comrades, though he believes Dempsey to be "The Missing Link." ~ Edward Richtofen on his attempts to make zombies fly via the use of high explosives. They're rather fond of company, and they won't stay away. always attacked when commanded and had to be killed. If they didn't go down the first time, try suppressing the human gag reflex, or just turn on the power; that always works. Hellhounds: Hellhounds, another experiment gone wrong from the infamous Dr. Maxis, are generated from balls of electricity and most likely wish to kill the current player. Maybe they just want a good game of fetch! Element 115: This large, glowing boulder of radioactive material can be found in almost every map since "Shi No Numa" ("Swamp of Death"), and is the source of the zombies' reanimation (but still has nothing to do with the power, even if the generator so happens to be powered by this stuff). The utilities are devices that either function as weapons, or help activate something else. The utilities were first introduced in Verrückt in the form of the ever so famous power switch and electrical trap. The utilities are an absolute necessity for survival at higher rounds, but can be a burden in lower rounds, as they are harder to reach. The following is a list of utilities and their descriptions. Mystery Box: Just like spam (electronic and/or canned spam), it makes the player want to open it to see what is inside it. On occasion, it will grace the player with a Wunderwaffe DG-2 or a monkey bomb, but it mostly gives Molotov Cocktails to further annoy the player on this asinine waste of points. The Pack-A-Punch machine while in slot mode. To activate: Turn on power and insert coin. Teleporter: It's a teleporter; it needs not to be explained, for it does that on its own. Yet, the power must be restored to use it, rendering it useless until the power is turned on, and until the teleporter is linked to the mainframe. These hindrances render the entire concept useless, due to the over-complicated nature of the utility (and possibly the confounded abuse of wording in this sentence). 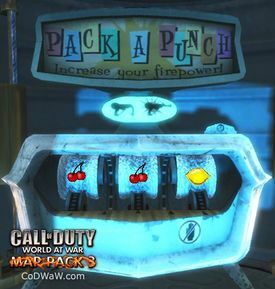 However, to unlock the Pack-A-Punch machine, a special task must be performed (each is different on all maps including the machine). Said tasks involve linking all three teleporters to the mainframe in Der Riese (German for The Giant), to lowering the DEFCON level back down to five, ironically, in the map, "Five". Flogger: Much like the spinning motion on a fishing reel, this large wooden contraption spins around as an unsuspecting civilian zombie walks into it. This device is often confused with a type of torture, which involves beating a victim into submission. Electrical field: It shoots electricity out in arcs under the generator, much like the Wunderwaffe, killing them. This trap, however, is also harmful to the player, and it makes no sense whatsoever to revive the downed player, for it could kill the player who is reviving the aforementioned downed player. Obviously, the power needs to be turned on first. Power Switch: It switches on the power. Turning on the power with the switch, even though as easy as it is to reach, is very hard to do in early rounds due to a lack of zombies to kill for points. However, once activated, more utilities are available for use, and more shortcuts become available. 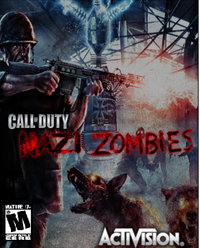 Perk-A-Colas, introduced in the Nazi Zombies map "Verrückt", give special powers in the form of perks to the players. However, the power must be activated before use, rendering the machines totally and utterly useless early in the game. Below is a list of the colas and a description for each. Jugger-Nog is something to only be drunk on Christmas, since it has the ability to get the player drunk faster and somehow gives the player an exponential gain in body mass. This allows the player to wield his or her trench knife to knife-and-kill oncoming zombies in less hits and take more pain due to the numbness caused by the alcohol intoxication. Speed Cola was actually going to be a candy tablet called Riccola, but it was changed to Speed Cola due to trademark infringement suit threats from a pharmaceuticals company. To make it live up to it's name, the company literally put their sweat and blood into the mix to make the player as fast as a Kenyan athlete. However, the active ingredient does rot the mind, and the fact is agreed upon by nine out of ten doctors, or maybe the voices in Richtofen's head. NOTE: This cola does not help turn on the power. 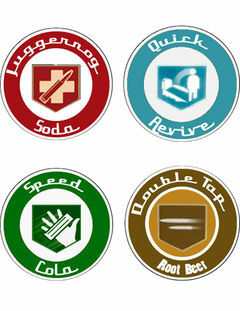 Quick Revive apparently is just a bottle of soda, the only thing it does is give the player a stronger dose of morphine (or probably fish oils, hinted by the drink's fishy taste) so said player can revive others faster, and (somehow) revive oneself. Unfortunately, Treyarch determined by various statistics of survival rates that the player(s) shouldn't be able to survive as long, and made it cost 1500 credits a pop in multiplayer to ruin chances of survival against very large hordes of zombies). Double Tap Root Beer allows the player to double tap your foot to western-style music, but also makes the player (as an, obviously, unintended side effect) slightly stockier, allowing for more insulation from recoil, in turn, allowing the player to take faster fire from heavier weapons. However, this soda makes guns that already have a high rate of fire cause the game to glitch. Therefore, the game will freeze and crash immediately, following by the crash of the device the game is being played on itself. NOTE: Double Tap doesn't help turn on the power, no matter how fast you shoot the power switch. The Wunderwaffen (meaning "Wonder Weapons" in English, "Wonder Waffles" in Dempsey) are special weapons that can only be obtained via the mystery box. They can affect the outcome of the game or round, and achievements or trophies are available for obtaining certain Wunderwaffen in a certain time period. 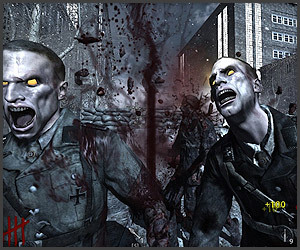 The Wunderwaffen in Nazi Zombies were all designed by Edward Richtofen and Ludwig Maxis at the Der Reise project (the same origin place of the zombies). Each Wunderwaffe has a different power or effect, such as the DG-2, which shoots lightning (yet, it still can't turn on the power). The following is a list of Wunderwaffen and the descriptions of what they do. Ray Gun: Shoots highly explosive, green balls of energy, in a somewhat similar fashion to the little blue pill everyone has seen on commercials. It can completely destroy a zombie, or it will just make it very angry. Neither turn on the power. 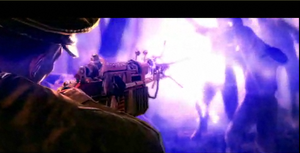 The Wunderwaffe DG-2 in use by Richtofen. Note how it doesn't turn on the power, but still shoots lightning. Really original. Wunderwaffe DG-2: A gun that shoots electricity in a wide arc, killing many of the little buggers. Strangely, it has nothing to do with waffles or toasters (much to Dempsey's dismay) in any matter, and though it shoots electricity, it can't turn on the power. Monkey Bomb: A weird contraption comprised of a happy monkey with a explosives strapped on to it's back. It attracts the zombies and sometimes causes them to fight amongst one another until their death. It is also very fun to watch the zombies dance around on fire afterwards. This article was nominated to become a featured article; however, due to several votes being devoured by an Altmer, it didn't make the cut (8/10.5). Don't let this happen again! For just pennies a day, you can prevent another travesty of this nature, or vote for other articles at Uncyclopedia:VFH. This page was last edited on 2 September 2013, at 01:33.